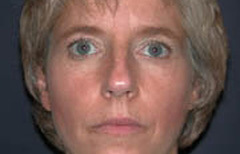 This pleasant forty-eight-year-old female underwent multiple cosmetic procedures simultaneously -rhinoplasty; liposuction of arms and trunk; and mini-abdominoplasty. She wanted to smooth the bump on the nose and change the shape of the tip. She has problems breathing out of the left side of her nose. Examination also showed deviation of the septum causing significant left nasal airway obstruction. She underwent surgery to correct the deviated septum and reshape the nose. 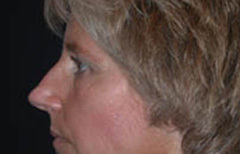 Using an open rhinoplasty approach, the bump on the nose was removed and the tip narrowed. The deviated septum and was corrected. A thin layer of tissue was placed underneath the skin of the nose to get a more smooth contour. Her early results at six weeks show a smooth contour of the nose and tip. She is breathing through both sides of her nose well. The swelling of the nose will continue to improve over the next nine months.